The city of Edinburgh is once again in the midst of Festival fever, welcoming hundreds of thousands of performers and visitors from all over the world for Edinburgh Festival Fringe, the largest arts festival in the world. With thousands of shows being put on throughout August, multi-purpose venues are under the spotlight. While everything from coffee shops to giant inflatable cows are among some of the more unusual locations to have hosted Festival Fringe performances in recent years, some of the city’s most well-known and diverse venues also take centre stage. 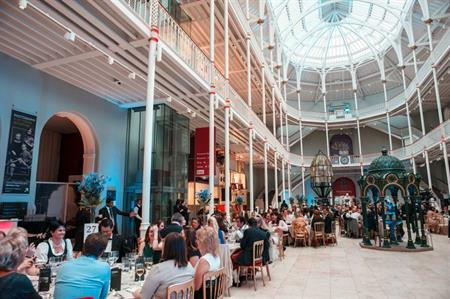 The Edinburgh International Conference Centre, the Usher Hall, the Assembly Rooms and the National Museum of Scotland are among the venues which are as at home hosting business events as they are comedians and actors. The Royal Botanic Garden Edinburgh and the Edinburgh Centre for Carbon Innovation, meanwhile, are also among those venues which are being showcased to a Festival-going audience this summer. Scotland’s capital is abuzz as it hosts the largest arts festival in the world but, for all of these venues, the remaining 11 months of the year will see them play host to a diverse range of business events, gala dinners and launches.